A Palestinian man inspects the damage to his home after the neighboring ministry compound was destroyed during an Israeli airstrike on Tuesday in Gaza City, Gaza Strip. GAZA CITY, Gaza Strip — Israel, under international pressure, is considering a 48-hour halt to its punishing four-day air campaign on Hamas targets in Gaza to see if Palestinian militants will stop their rocket attacks on southern Israel, Israeli officials said Tuesday. Any offer would be coupled with a threat to send in ground troops if the rocket fire continues. Prime Minister Ehud Olmert discussed the proposal — floated by France's foreign minister — and other possible next steps with his foreign and defense ministers, Israeli officials said, speaking on condition of anonymity because they were not supposed to make the information public. President George W. Bush and Secretary of State Condoleezza Rice called leaders in the Middle East to press for a durable solution beyond any immediate truce. And members of the Quartet of world powers trying to promote Mideast peace concluded a conference call with an appeal for an immediate cease-fire. The Quartet powers are the United States, the United Nations, the European Union and Russia. The European Union itself late Tuesday also urged an immediate truce and for Israel to reopen borders to allow vital supplies to reach Gazans. The Paris statement by the 27-member bloc avoided blaming either side for the current fighting. In its Tuesday night meeting, Israel's leadership trio stepped up preparations for a ground offensive, conducting a telephone survey among Cabinet ministers on a plan to call up an additional 2,500 reserve soldiers, if required. Earlier this week, the Cabinet authorized a callup of 6,700 soldiers. After the four-hour meeting, Olmert's office issued a statement early Wednesday saying no details of the discussion would be made public because of the sensitivity of the subject matter. But Israeli officials, speaking on condition of anonymity because they weren't authorized to release information on the meeting, said the leaders wanted Hamas to agree to stop the rocket fire before Israel moves on any truce proposal. A Hamas spokesman said earlier in the day that any halt to militant rocket fire would require an end to Israel's crippling blockade of the Gaza Strip. "If they halt the aggression and the blockade, then Hamas will study these suggestions," said Mushir Masri. And even amid talk of a truce, Israeli warplanes continued to unload bombs on targets in Gaza Tuesday and early Wednesday morning. Powerful airstrikes caused Gaza City's high-rise apartment buildings to sway and showered streets with broken glass and pulverized concrete. Israel's ground forces on Gaza's border also used artillery for the first time. Hamas kept up its rocket barrages, which have killed four Israelis since the weekend, and sent many more in running for bomb shelters — some of them in cities under threat of attack for the first time, as the range of the rockets grows. A medium-range rocket hit the city of Beersheba for the first time ever, zooming 28 miles deep into Israel and slamming into an empty kindergarten. A second rocket landed in an open area near the desert city, Israel's fifth-largest. The military said later it successfully struck the group that launched those rockets. A pattern of daytime lulls and nighttime spikes in rocket fire appeared to be emerging as militants found safer launch cover in darkness. Four days into a campaign that has killed 374 Palestinians and prompted Arab and international condemnation, a diplomatic push to end the fighting gathered pace. In two phone calls to Defense Minister Ehud Barak on Monday and Tuesday, French Foreign Minister Bernard Kouchner appealed to him to consider a truce to allow time for humanitarian relief supplies to enter the beleaguered Gaza Strip, two senior officials in Barak's office said. Foreign Minister Tzipi Livni was expected to travel Thursday to Paris for talks with French President Nicolas Sarkozy, who has put his growing international stature to use in other conflict zones, most recently to help halt fighting between Russia and Georgia in August. Israeli media reported that Sarkozy would also travel to Jerusalem Monday for talks with the Israeli and Palestinian leaders. 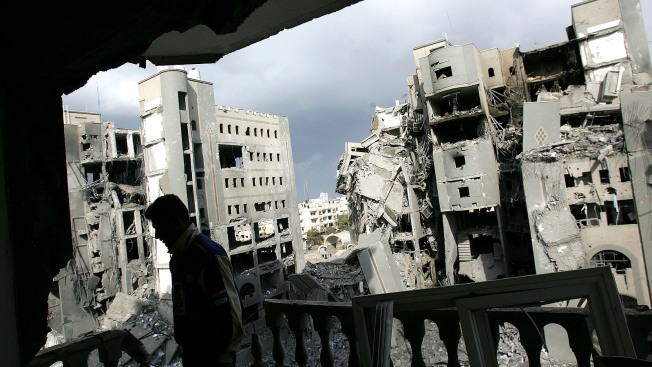 Any cease-fire between Israel and Hamas would face questions about its long-term viability. In the past, Hamas has been unable or unwilling to rein in all the militants, some of which belong to different factions. Israel has angered the Palestinians by continuing to target its leaders and by maintaining a blockade of the Gaza Strip. "It's certainly difficult for Hamas because, having witnessed the losses that they have just suffered on large scale, their credibility is on the line and they're not going to easily agree to a cease-fire that goes back to the conditions that prevailed before, after all these losses," said Shibley Telhami, professor of political science at the University of Maryland and senior fellow at the Brookings Institute. "So, we're likely to see more bloodshed, and I think that is where we are in a way, events on the ground are going to dictate." Israel's military, meanwhile, pressed on, sending warplanes to strike a Gaza government complex that includes the ministries of interior, foreign affairs and justice. Bombs ripped the tops and sides from buildings that had already been evacuated and left fires blazing in upper floors. It was the largest government target hit so far and involved the largest number of bombs dropped in a single strike — at least 16 in all. The airstrikes have sent the people of densely populated Gaza on a zigzagging desperate search for safer ground — hard to find with no way out of the blockaded territory. "I don't know what's safe anymore," said university student Rasha Khaldeh of Gaza City. She fled her home, fearing Israel would target her Hamas neighbors, then had to leave her uncle's house because of nearby shelling. She listens intently for the approach of pilotless Israeli drones. After nightfall, Israel destroyed 40 tunnels under the sealed Gaza-Egypt border in another attempt to cut the vital lifeline that supplies Gaza with both commercial goods and weapons for Hamas and other militant groups. Israel kept up the attack on the tunnels early Wednesday, setting off a huge explosion in a tunnel containing fuel, witnesses said, as other aircraft hit Hamas positions in Gaza City. No casualties were reported. The Israeli military said government buildings were hit, including an office of Hamas Prime Minister Ismail Haniyeh. Israel's military said it hit 31 targets on Tuesday, including a Cabinet building, rocket-launching sites, and places were missiles were being built. Some of the hits on sites with weapons stockpiles triggered secondary explosions. The question still hanging over the Israeli operation is how it can halt rocket fire. Israel has never found a military solution to the barrage of missiles. The "Iron Dome," a system to guard against short-range missiles, will take years to build. Hamas also said it would take more to cripple it. A spokesman for Hamas' military wing, Abu Obeida, said the group remained strong, and he vowed to fight on as long as Israel continues its airstrikes. He noted that even while under heavy airstrikes, militants had fired rockets that reached Israeli towns farther from Gaza than ever. "Rockets will be on your daily agenda," he said in a message to Israelis. And if there's a ground invasion, he promised worse: "If you enter Gaza, the children will collect your flesh and the remains of your tanks which will be spread out through the streets." The offensive came shortly after a rocky, six-month truce expired. Emad Falluji, a former Hamas leader working at a Gaza-based think tank, said he believes Hamas had wanted to renew the truce but felt humiliated by Israel's decision to maintain a tight blockade on Gaza. "Israel didn't want to give Hamas anything in return for the cease-fire, which was effectively free," he said. Egypt, which has been blockading Gaza from its southern end, has come under pressure from the rest of the Arab world to reopen its border with the territory because of the Israeli campaign. Egypt has pried open the border to let in some of Gaza's wounded and to allow some humanitarian supplies into the territory. But it quickly sealed the border when Gazans tried to push through forcefully. Mubarak said his country would not throw open the border crossing unless Palestinian President Mahmoud Abbas — a Hamas rival — regains control of the border post. Mubarak has been rattled by the presence of a neighboring Islamic ministate in Gaza, fearing it would fuel more Islamic dissidence in Egypt. Most of the Palestinians killed since Saturday were members of Hamas security forces but the number included at least 64 civilians, according to U.N. figures. Among those killed were two sisters, Haya and Lama Hamdan, ages 4 and 12, who died in an airstrike on a rocket squad in northern Gaza on Tuesday. During brief lulls between airstrikes, Gazans tentatively ventured into the streets to buy goods and collect belongings from homes they had abandoned after Israel's aerial onslaught began Saturday. The campaign has brought a new reality to southern Israel, too, where one-tenth of the country's population of 7 million has suddenly found itself within rocket range.